We are standing at the beginning of a new business era shaped by artificial intelligence and machine learning. In 2016 alone, revenue from the artificial intelligence market worldwide reached more than $1.3 billion and by the end of 2025, that figure will likely reach a $59 billion. To maintain their competitiveness, businesses are embracing this new technology. But being at the vanguard of AI revolution can be costly, big time. Any company wanting to cash on the machine learning wave will have to act fast. But to do so, specific know-how is needed in the shape of IT professionals capable of developing and implementing solutions based on machine learning. And this is where the problems start because those specialists are not cheap. Lack of specialists – there are not enough people with the necessary skills because they are quickly harvested from the market by the bigger players with huge budgets offering fat paychecks. High employment costs – this results from the first point; those specialists still on the market have high earnings expectations, knowing that there is an enormous demand for their skills. Because of that, companies which plan projects involving artificial intelligence, machine learning, and other linked technologies are facing the problem of high recruitment and salary costs. How high are they actually? There are numerous job positions related to AI and machine learning, but for this article, I focus on machine learning engineers because the market demand for this role has increased significantly in the past few years. How high are the earnings of ML engineers? Finding a simple answer to this question is difficult. There are various sources and data available and I’ve used three separate sources: Glassdoor, PayScale and Indeed. Summing up my findings in just three words: through the roof! 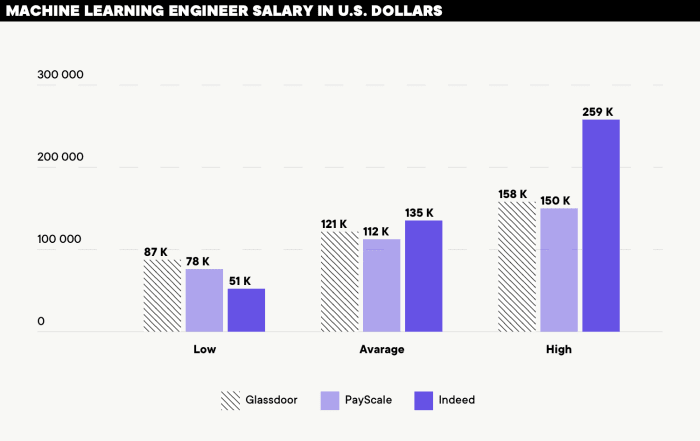 According to Glassdoor, an ML engineer can expect a salary ranging from $87,000 to $158,000 (on average $121,000), depending on experience and skills. On PayScale the range is: $78,000 – $112,000 – $161,000; Indeed, in turn, provides a range of $51,000 – $135,000 – $259,000. This data only applies to the U.S. market. By averaging from just these three sources, we can estimate that the average salary of a machine learning engineer is around $123,000 per year which is consistent with findings from TechRepublic, and IBM reports. However, the above chart doesn’t give the whole picture – it’s just the tip of the cost iceberg. For example, an AI specialist with experience and a Ph.D. can expect a salary as high as $ 300,000 – $500,000 per year and the average salaries of Google’s DeepMind staff in Great Britain is $345,000, according to a NYTimes feature article. For businesses with “slightly” smaller budgets than Google, these costs can be overwhelming. There is no conclusive data which can provide an answer to the question how big is the market demand for machine learning jobs, particularly for ML engineers. According to an IBM report cited by Forbes, by 2020, in the U.S. alone, there will be 700,000 openings for data scientist-type jobs, including ML engineers. At the same time, Tencent estimates that there are only 300,000 AI engineers worldwide when millions are required. Even if this data is not precise, one thing is for sure; the demand is increasing. 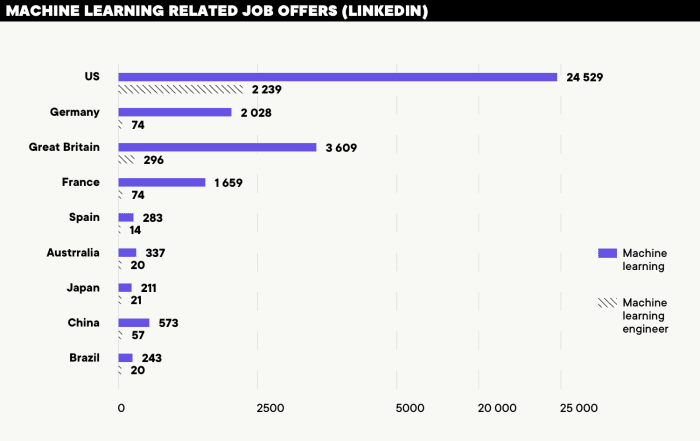 According to the LinkedIn report, there are almost ten times more jobs for machine learning engineers than there were five years ago, and this figure will only rise in the future. Can outsourcing be a solution? Skyrocketing earnings and huge market demand for ML engineers might be challenging for companies considering machine learning projects. For some companies, outsourcing ML projects to an external provider with trained and experienced ML engineers might be a solution. Of course, this approach has pros and cons, but that’s a topic for an entirely different article. Nevertheless, in the face of extremely high costs related to the employment of machine learning engineers (and other AI-related specialists), the price and time factors are gaining a whole new dimension, and soon most companies wanting to take a cruise on the ship called artificial intelligence will face the dilemma: outsource or not?